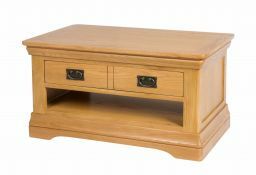 This coffee table is a brand new design for Top Furniture. 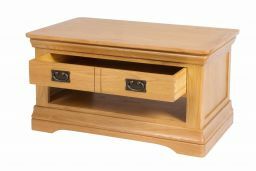 The farmhouse coffee table with drawer & shelf is manufactured from sustainable American Oak and is finished with a hard wearing oiled wax which brings out the natural beauty of the American Oak. 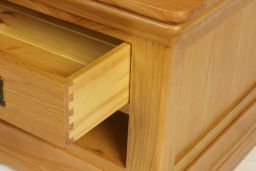 Handmade with dovetail joints on all drawers. Delivered fully assembled and ready to use. 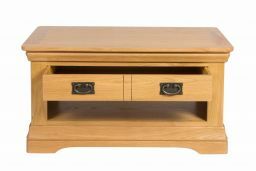 This coffee table is manufactured as part of our Farmhouse Oak Range. 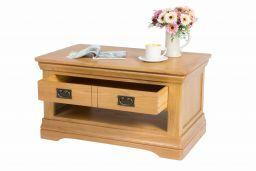 I have purchased various items in the Farmhouse Oak range including a sideboard, TV unit, Console Table and the coffee table . I am very pleased with the quality of the items. The order was placed on Thursday and delivered on the following Wednesday. The items were exceptionally well packaged and I will recommend this company to family and friends. 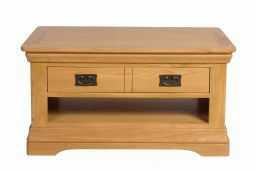 Great piece of furniture at a good price and available to take away - another good experience at Top Furniture. Excellent products. First class customer service. Will be back for more.